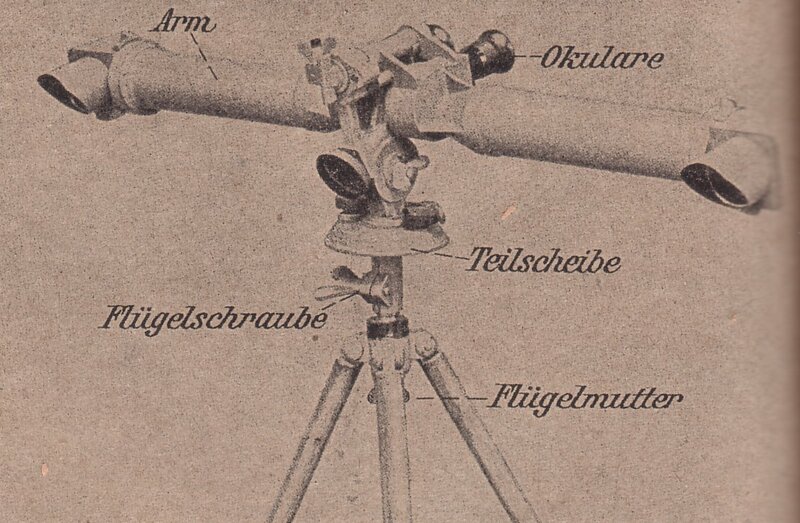 (Below) is an image of the Foot Artillery Forward Observer Scope Model 1909 (S.F.09) with the "Arms" set horizontally. 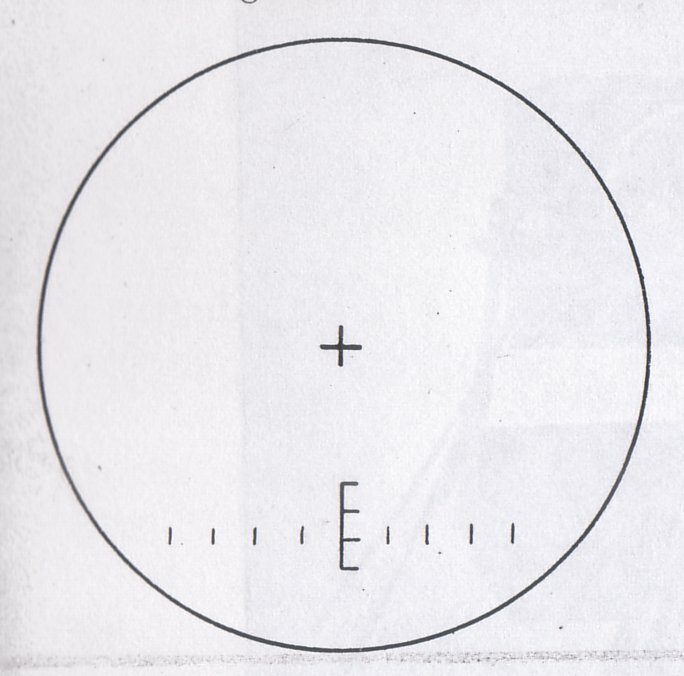 The dial aiming circle like base would have been a 0-5760 through the mid part of the war. 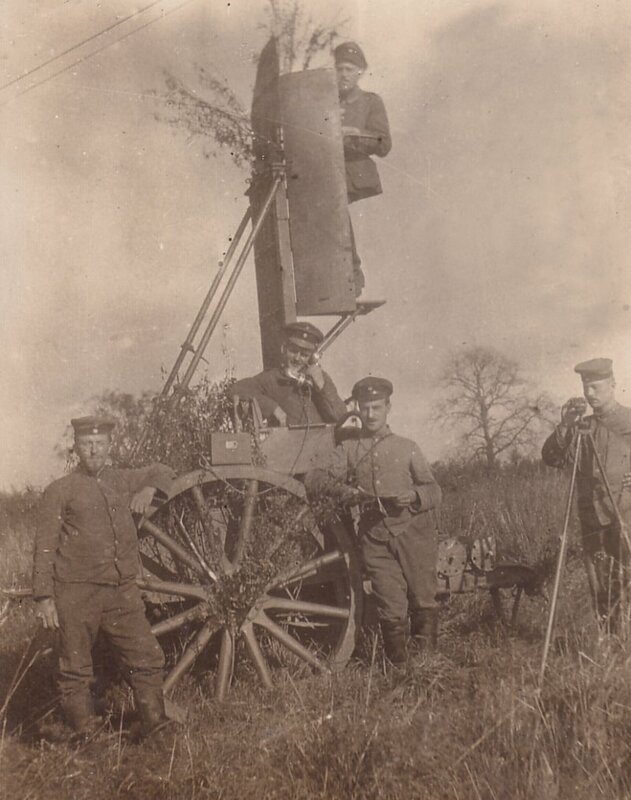 Around 1916 Foot Artillery units began to transition to the Field Artillery's 0-6400 scale. (Below Left) is the base for the S.F. 09 Forward Observer Scope removed. 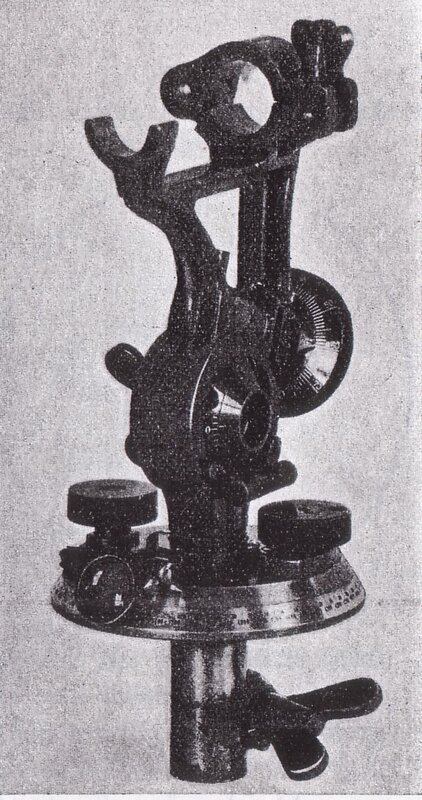 This is a 0-5760 scale device and may have been modified to 0-6400 after 1916. 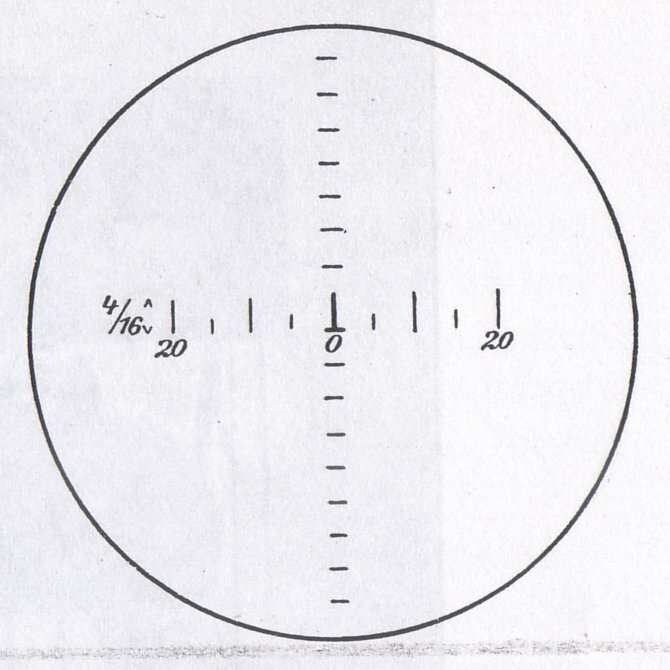 (Below Right) is the reticle pattern for the S.F.09 Scope in the 0-5760 or 1/16th of a degree scale. Below. This is an example from the collection, identical to the above period photograph, of the S.F. 09. In this example, the instrument is in a Foot artillery configuration, with the scope mounted onto the 0-5760 scale lower dial. (Below) is an unusual example. 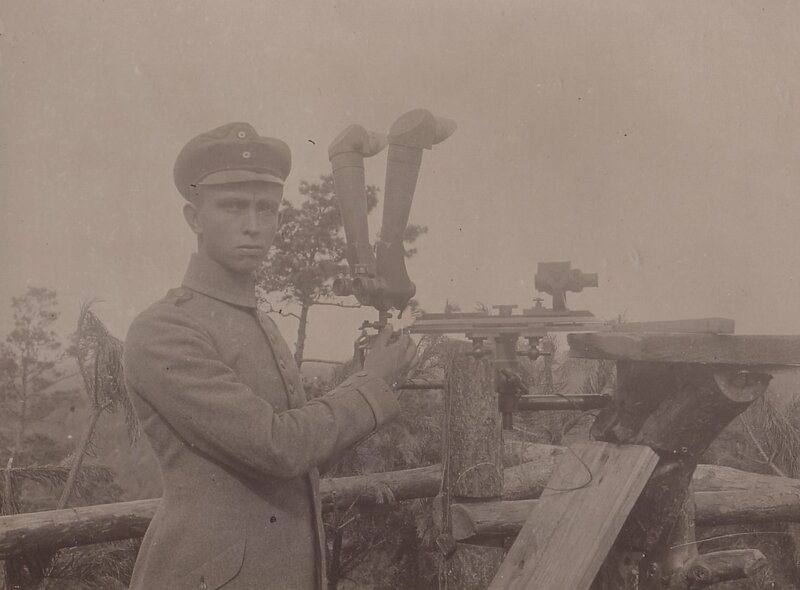 In this original photograph, a Foot Artillery NCO has a forward observer scope (which is not the S.F. 09 Type) with a dial scale mounted under it in the 0-5760 or possibly 0-6400 scale. The device to his right is a Foot Artillery Aiming Circle in the 0-5800 scale (with an optic attached). My guess is that he is observing for more than one battery and one of these batteries is still using the old 0-5800 scale for their howitzers. Using the second system, with the 0-5800 scale to observe, then means he does not have to do the math step to covert from 5760 (or 6400) for them. I'm sure there are other possibilities. Let me know if you can figure out a better explanation. Below. 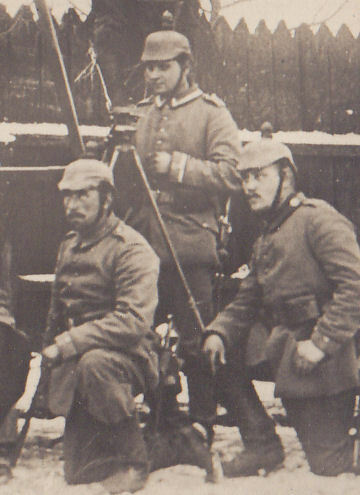 This is an example in the collection of the same type Foot Artillery Forward Observer Scope as is pictured above. I believe this type came out during the war. I am not certain of the manufacturer. It does, however, have the same reticle pattern as the S.F. 09 Foot Artillery scope. Here it is mounted on the same 0-5760 scale dial and tripod as seen with the S.F. 09. (Below Left) is an image of the S.F.09 Forward Observer Scope for Field Artillery Service. Note that it does not have the lower dial section section attached as with the Foot Artillery scope. It appares that there was no Field Artillery lower dial for the scope. This would mean that a compass or terrain schetch would likley have been used to independently give a direction to the target. (Below Right) This is the reticle pattern for the Field Artillery Scope S.F. 09 (0-6400). 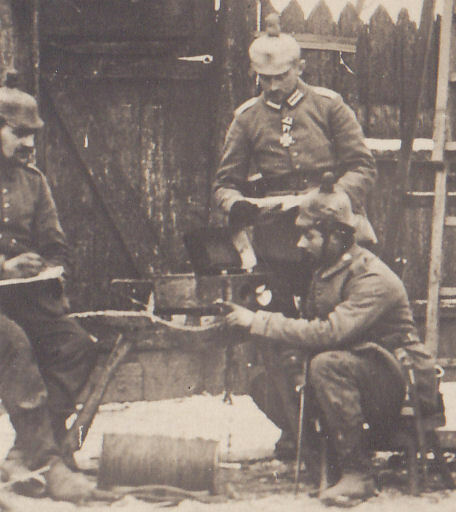 Below: German Field Artillery Observer Team. The officer standing on the later is most likely using a S.F. 09, however, it is not visible in this shot. 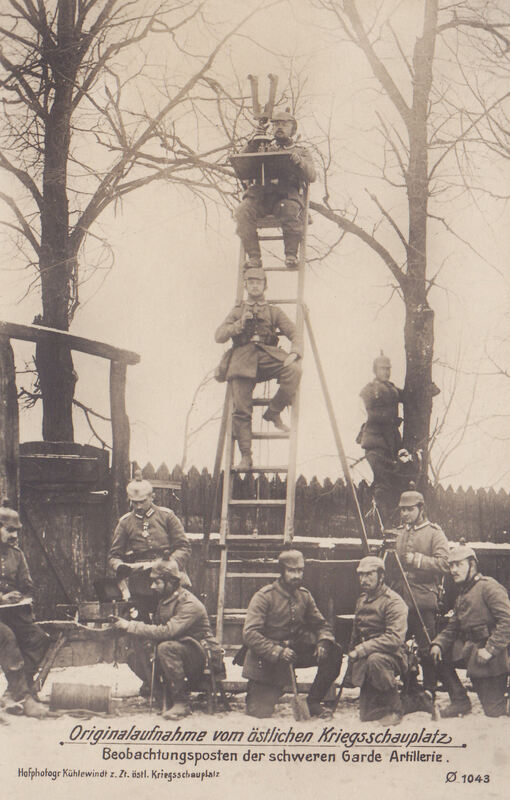 Also notice the field phone used to talk to the firing battery and an aiming circle for surveying in the Forward Observation Point.